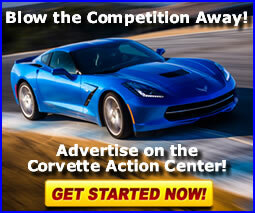 The Corvette Action Center interviewed several engineers, brand managers and public relations operatives at Goodyear. We learned a heck of a lot of general information about tires on Corvettes and other cars and light trucks. We are going to start with a sort of "Tire FAQ" we complied from the Goodyear interview sessions. 1) I should inflate my tires according to the pressure indicated on the tire sidewall? The handwriting's not on the wall–the tire sidewall, that is. The tire's maximum inflation pressure not the vehicle manufacturer's recommended pressure, is molded on the sidewall. For normal operation, follow pressure recommendations in the vehicle owner's manual or on the vehicle placard located either in the glove box or on the driver's door post. The function of air in a tire is to support the weight-carrying potential of a vehicle, according to Goodyear tire engineers. Tires are built and rated to carry certain load capacities. Automakers select tires compatible with the ride, handling, traction, fuel economy and load requirements of their vehicles. Vehicle manufacturers determine inflation pressures based on these requirements. 2) A tread pattern is needed to provide great traction on dry roads. A racing "slick", a tire without any tread, provides the ultimate in dry traction due to the maximum amount of rubber in contact with the road. A grooved tread pattern actually reduces traction on dry roads but acts as a squeegee on wet roads to remove water from under the tire and channel it through the grooves and away for improved wet traction. That's why the Goodyear Aquatred III's directional, "aquachannel" tread design along with the similar design used by the Goodyear Eagle GS-C and the Eagle F1 GS, grabbed so much attention when it was introduced. The Goodyear F1 Supercar exposed. This is the tire on the new Z06. It's Goodyear's newest performance tire and its basic design features are typical of many of the so-called "ultra-performance" tires. Image: Black Dog Design/Chevrolet Communications. 3) If not for the cost, race tires would be the ideal street tire for high-performance vehicles. Race tires are engineered for specific track surfaces and race vehicle suspensions. On a street-driven, high-performance car, race tires wear too quickly, provide an uncomfortable ride and deliver poor handling on wet or icy roadways. Rather than transferring race tire technology in total, in many cases, certain technology used at the racetrack is engineered into high-performance street tires. For example, ultra-high-performance tires, such as Goodyear's new Eagle F1 Supercar on the 2001 Z06es, employ a stiffer carcass and aggressive tread compounds to provide the performance attributes required for ultra high-performance vehicles. 4) Performance tires wear out faster because of the sticky compounds. Performance tires may wear out faster than conventional family-car tires; however, tread rubber polymers aren't the culprits. In fact, new polymers and ultra-tensile steel constructions are making performance tires last longer than ever. Industry-wide, performance tires average about 45,000 miles in tread life, similar to the figures for tires used on ordinary passenger cars. More often, rapid tire wear usually is due to powerful vehicles and aggressive driving. 5) Wide tires provide better traction under all weather conditions. Putting oversized snow tires on a car delivers better snow traction. In fact, the opposite is true. Wide tires tend to "float" on deep snow and the tread lugs never have a chance to "dig" through the snow to the road surface to gain traction. Narrow tires are a better option in deep snow. The tire acts similar to a knife cutting through butter; the blade works best when using the narrow edge to push through the butter rather than the wide flat side of the blade. 6) All-season tires are so good that winter tires are unnecessary. In some parts of the country this may be true, but if you live in the northern-most states or in Canada, the traction provided by winter tires can't be beat. Winter tires reign supreme in rural areas where snow remains on the road for days. They provide 25 percent improved traction in deep snow over all-season tires. Metal-studded tires deliver up to 40 percent greater traction on hard-packed snow and ice over all-seasons. 7) Never rotate tires from side to side, only front to back. With any car having the same size tires at all four wheels, their radial tires can be crossed from side to side in the rotation pattern. The old front-to-back rule applied to bias ply tires. Regular tire rotation about every 6,000 to 8,000 miles, promotes more uniform wear for all tires on a vehicle. Goodyear recently designed a light truck tire system that requires no rotation, the Wrangler RF-A, which provides a rear tire with a different tread design from the front tire. 8) Sticking your fingernail in the tread can help pick the tire with the softest compounds, and thus, the best adhesion. It's sort of like kicking the tire, but with another part of the anatomy. Tread compounds only tell part of a tire's story. Tread pattern, tire shape and the tire footprint shape on the pavement provide clues to its adhesion capabilities. Don't rely on the fingernail test. 9) The government tests tires for traction, temperature resistance and treader and assigns grades that are molded onto the sidewall. Uniform Tire Quality Grading is a federal law that requires tire manufacturers to grade their tires for tread wear, traction and temperature resistance. Tire manufacturers, not the government, test tires and assign their own grades. Unfortunately, the government has not yet prescribed a formula for converting the manufacturers test results into grades; therefore the numbers are not objective. According to the Federal Trade Commission, treader grades are for comparison purposes only and are not intended to be converted into anticipated or promised tire mileage. 10) Tires are made of a single rubber compound. Several polymers are used in a tire, depending on their performance characteristics. Run-flat or extended mobility tires (EMT), for example, use heat-dissipating polymer reinforcements that stiffen tire sidewalls, while tread compounds affect traction, treader, rolling resistance and noise. In the case of the Eagle F1 Steel ultra-high-performance tire, its AATRAX triple polymer tread compound system provides improved handling and wet and dry traction without sacrificing treader, snow traction, rolling resistance or noise. 11) Well-engineered tires will overcome deficiencies in the vehicle. Even premium tires can show signs of premature or uneven tread wear and imprecise steering when vehicles have improper wheel alignment or worn suspension parts. Correct wheel alignment is a must and should be checked periodically. Improper alignment causes excessive tire wear as well as increasing fuel consumption. Regular tire rotation also promotes more uniform wear for all tires on a vehicle. 12) An ultra-low rolling resistant tire provides outstanding fuel economy. A tire engineered for low rolling resistance would provide horrible fuel economy when it is run under inflated. Running tires 20 percent under inflated increases fuel usage by as much as 10 percent. That amounts to Americans wasting nearly 4 million gallons of gasoline daily. Tire care is crucial in saving money at the pump. 13) An undulation on a tire sidewall is a weak spot that could lead to tire failure. An undulation is created where materials overlap each other in the tire carcass, and it actually is the strongest part of the tire. Still, motorists perceive a "wave" on the sidewall as a defect. Goodyear's new ultra-tensile steel reinforcement eliminates this material splice and overlap. Ultra-tensile steel should reduce sidewall undulations found in polyester reinforced tires. 14) Tires are a low-tech commodity, and price should determine what to buy. Consider the rain, run-flat and performance tires on the market today. Time and technology have improved the quality and value of today's tires. Price should be only one consideration, along with the other factors that can enhance tire value and vehicle handling. For the industry, average passenger tire life has climbed from 24,000 miles in 1973 to about 47,000 miles today. No one would want to turn back the clock on tire developments or prices. On a cost-per-mile basis, tires from the so-called "good old days" would cost more than three times that of the 65,000-mile warranted Goodyear Aquatred III radial tire. 15) Before you buy a car, kick the tires. It won't tell you much about the vehicle or tires, but it will tell you if your shoe padding is adequate. Besides these FAQs, in light of the recent public controversy about tires, we asked the Goodyear guys some more specific questions about the various markings of the sidewalls of the Eagle F1 GS-EMTs on many C5s and those on the tires of other Corvettes. We found that although it's something you probably won't take to bed, a tire sidewall actually makes for good reading. Consider the wealth of information embedded in the rubber that covers everything from the auto tire's size to its "genetics," say Goodyear engineers. Pretty gripping stuff. Uh....no pun intended. Even if it's true that you can't tell a tire by its sidewall, the numbers and letters on its sides still can reveal some notable facts about the tire, the Goodyear folks told us. We learned that "M+S" or any combination of the letters M and S signifies mud-and-snow certification, defined by tread patterns with angled slots and grooves that are a minimum 25 percent of the footprint. M+S tires are meant to provide improved starting, stopping and driving performance in the snow, compared to similar tires not marked M+S. The Rubber Manufacturers Association (RMA), which includes Goodyear, took the global industry lead in 1999 in designating winter tires that would carry the mountain/snowflake symbol on the sidewall which looks like this. This severe snow service designation is based on traction performance, a more stringent requirement than the M and S rating. "P" designates a tire primarily designed to fit passenger cars. Other letter possibilities are LT for light truck and T for temporary spare. Actually, the prefix letter is optional so it might not be included in all cases. P designates a tire primarily designed to fit passenger cars. Other letter possibilities are LT for light truck and T for temporary spare. We should point out, however, the prefix letter is optional, so it might not be included in all cases. The first number in the size designation, such as the 275 in a P275/40ZR17 tire you might find on a later C4, is the cross-section width of this tire in millimeters. The next number in our example, 40, is the "aspect ratio" or ratio between cross-section height (from the bead that holds tire on the rim to the tread) to cross-section width (from sidewall to sidewall at its widest part). For example, a 275-mm or 10.8-inch-wide tire with a 40 aspect ratio has a section height of 4.3 inches (10.8x0.4). R means radial tire construction. Modern Tire Dealer magazine estimates 99.7 percent of the passenger tire market is radial. Other possible construction letterings are B for belted-bias construction and D for diagonal (bias) construction. Other possible construction letterings are B for belted-bias construction and D for diagonal (bias) construction. 17 is the wheel diameter in inches. The range of wheel diameters on today's passenger cars is 12 to 20 inches. Directional tires, such as Goodyear's Eagle GS-C and F1 GS-EMT, increase the ability of the tread design to disperse water from under the tire for improved wet traction. An arrow on the sidewall, primarily added for the tire installer, shows the direction that the tire rotates. Without a chart, the load index and speed rating can be unreadable. Although the load index numbers are too numerous to list here, the important thing to remember is that a higher load index number means a higher load capacity. Never replace a tire with another tire having a lower load index number. The speed rating letters include S for speeds up to 112 mph; T, up to 118 mph; H, up to 130 mph; V, up to 149 mph; W, up to 168 mph; Y, up to 186 mph and Z, 150 mph and higher. The speed rating indicates the maximum speed at which the tire may be operated, but it does not imply that the vehicle may be safely driven at that speed, particularly under adverse conditions. A list of tire components provides the tire's "genetics," such as the number of tire plies under the tread and in the sidewalls plus the type of materials used. Tire manufacturers are required to grade their passenger car tires for tread wear, traction and temperature resistance and assign Uniform Tire Quality Grading Labels according to regulations established by the National Highway Traffic Safety Administration (NHTSA). Tire manufacturers, not the government, test tires and assign their own grades. The tread wear grade or number, according to the United States Department of Transportation, is for comparison purposes only and is not intended as a measure of anticipated or promised mileage from a specific tire on a specific vehicle. Since each manufacturer assigns its own number, a tire graded 220 by one maker might not deliver as much actual tread mileage as one graded 190 by another company. Interestingly, the tread wear grading, is based upon testing over a 7,200 mile distance on a government-selected, public highway in Texas. Temperature grades, A (the highest), B and C for tires that are properly inflated and loaded, represent a tire's resistance to heat and its ability to dissipate heat when tested under controlled laboratory conditions. Sustained high temperature reduces tire life. Excessive temperature may lead to sudden tire failure. Traction grades, AA(the highest), A, B and C, represent a tire's ability to stop on wet asphalt and concrete. A C-graded tire may have comparatively poor wet-traction performance. Goodyear's Aquatred 3 tire recently became the company's first broad market tire to earn the AA grade. The DOT symbol certifies compliance with the U.S. Department of Transportation tire safety standards and is followed by a tire identification or serial number. For tires manufactured before the year 2000, the last three numbers identify the week and year of manufacture, its so-called birthday. For example, 459 means the 45th week of 1999. Beginning in 2000, the last four numbers identify the week and year of manufacture. For example, 3500 means the 35th week of 2000. Other characters in the serial number are the tire maker's coding for tire size and type and manufacturing plant. Maximum load limits and associated maximum cold inflation pressures are indicated in both metric and English units. Exceeding a tire's load limit affects handling, tire life and fuel economy. For normal operation, follow the vehicle manufacturer's inflation pressure recommendations (listed in some owner's manuals and always listed on the vehicle placard located either on the driver's side door post or in the glove box) and not the maximum inflation molded on the sidewall. Tire inflation should be increased when adding to vehicle load, such as luggage or a camper in tow, before setting out on a long trip or for any sustained high speed driving, but never exceed the maximum inflation pressure stamped on the tire sidewall. Although the sidewall might not tell consumers the whole story in making a purchase decision, the writing on the sidewall and reputable tire retailers can help them make informed choices, the Goodyear people told us.